A trial of a simple, safe and cost-free modification to a technique used to treat patients in the emergency department with an abnormally fast heart rate, carried out in the South West, has been chosen as one of eight showcase projects for the 10th anniversary of the National Institute for Health Research (NIHR). The trial was managed by the Peninsula Clinical Trials Unit at Plymouth University, working with a research team led by the Royal Devon & Exeter NHS Foundation Trust. It was supported by the NIHR Clinical Research Network for the South West Peninsula. An abnormally fast heart rate, also called supraventricular tachycardia, can be distressing for patients and many of these patients have to attend emergency departments for treatment. Symptoms can include chest pain, light-headedness, dizziness and breathlessness. Episodes can last from a few seconds or, in extreme cases, for days. The safe and internationally recommended first time emergency treatment is the Valsalva manoeuvre. This is done by attempting to forcibly exhale while keeping the nose and mouth closed. Patients are also asked to bear down at the same time, as if they were making a bowel movement. This changes blood pressure and the rate and volume of blood returning to the heart. While recommended, the standard Valsalva manoeuvre has a low success rate of between five and 20 per cent, which often necessitates the use of other treatments such as a drug called adenosine. This drug can have significant side effects with many patients reporting a sense of doom or the feeling that they are going to die. 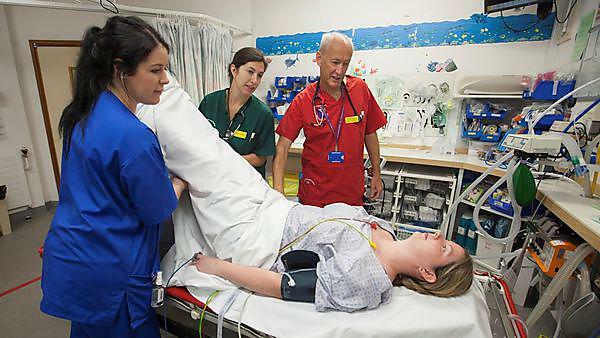 The trial - involving more than 400 patients across 10 NHS emergency departments -investigated whether a slight modification to posture in the Valsalva manoeuvre would improve its performance in treating patients with an abnormally fast heart rate. This was the first randomised controlled trial to assess the effect of modifying posture in the technique and its findings were published in The Lancet. The team found that lying patients down and raising their legs for a short time following the standard Valsalva manoeuvre was considerably more successful in reducing the abnormal heart rate than the standard Valsalva manoeuvre alone. In the study, only 17.5 per cent of patients using the traditional method experienced a return to normal heart rate, while for those using the modified technique the success rate was significantly greater, at 43.5 per cent. The findings of the study are significant, because they identified a simple, safe, comfortable-for-the-patient and cost-free method to improve the success rate of the Valsalva manoeuvre. This is important because it can potentially reduce the number of patients who require drugs with unpleasant side effects, decrease the number of other emergency treatments and result in fewer patients needing hospital admission. Since there is no cost, the modified technique can be introduced worldwide – including areas with limited health care resources. The technique can also be taught to patients to do at home, to help improve self-management.